An undeniable connection exists between Southwest Georgia’s economic development and institutions of higher learning. Colleges and universities impact the wealth and resources of communities in many ways and that’s true for Albany State University and Darton State College. In about a year, it will also be true for the consolidated university. For our regional economy to prosper, the new university must work strategically to support economic development by focusing on what we do well—provide technical assistance, promote global reach, create a quality workforce, transfer expert business knowledge and advance innovation and creativity. Through innovative research, colleges and universities provide the technical assistance needed to cure illnesses, develop innovative technologies and find solutions to everyday problems globally; we know this model to be applied research. Albany State University researchers Dr. Seong Seo, Dr. Byung-Hoon Kim, Dr. Yong J. Lee, and Dr. Shayla Williams, in the department of Natural and Forensic Sciences, are recipients of a $1.1 million grant from the U.S. Department of Defense to protect public health and U.S. military troops against the threat of bioterrorism. This is one of several research grants, which allow us to transfer the knowledge that is learned in the classroom and, through research, to address needs globally. To effectively serve our community, we must take advantage of our international reach, which allows the university to help the region compete globally. ASU has established relationships with international partner universities in China, Ghana, Nigeria, Belize and Trinidad and Tobago. We’re not alone, and not unique, in realizing the importance of thinking globally. I am reminded of my trip to the cities of Recife and Petrolina in the state of Pernambuco in northeastern Brazil. I was part of a Georgia delegation that participated in a partnership, which provides credence to the applied research model. The Georgia-Pernambuco Partnership united the state of Georgia with Pernambuco to advance research collaborations, facilitate faculty exchange and present additional opportunities for student success via unique recruitment strategies. That partnership has been successful because the agricultural community, businessmen and members of the academy understood that knowledge transfer was and remains a necessary element of economic vitality. Such partnerships should demonstrate that the primary influence in regional economic development is educating a quality workforce to enhance the local job market. That’s why employing expert instructors is important. Darton State College’s Dr. Sarah Kuck is an example of faculty who are helping to move us forward. Dr. Kuck was recently named the recipient of the 2016 Regents’ Teaching Excellence Award for online teaching for the University System of Georgia. Preparing individuals to be workforce leaders is something we do consistently well in Southwest Georgia. The number of graduates from our local institutions who serve in leadership positions in the public and private sectors is evidence. Consider the elected head of the City of Albany, Mayor Dorothy Hubbard, who is a proud ASU graduate. A university, through its faculty, staff and students, is uniquely positioned to support economic development through the transfer of knowledge. 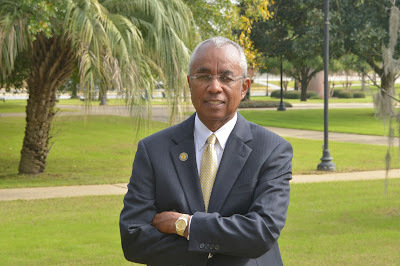 At Albany State University, specialized centers like the Georgia Water Planning and Policy Center and the Center for Advanced Logistics Management serve as resources to the community by conducting research, offering consultant services and providing interns. Forums and network opportunities with business representatives and industry leaders to advance community development initiatives are made available through the centers. Colleges and universities are hubs for creativity and innovation. On Tuesday, ASU will break ground on a state-of-the-art Fine Arts Center. The new center will continue to develop student talent and creativity, and it will be available to the community to serve as a source of revenue for the area through productions and events. Creative industries in Georgia provide $29 billion in annual revenue, according to a 2015 report by Georgia Council for the Arts and the Georgia Municipal Association. As we, the residents of Southwest Georgia, increase efforts to improve economic growth and stability for the region, our educational entities are committed to supporting economic development. Essentially, higher education institutions are in the business of educating residents and supporting communities, and that’s what matters most.